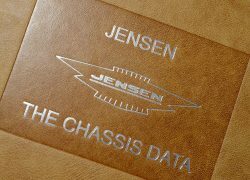 History of Jensen Motors: Jensen Motors Ltd was a British manufacturer of sports cars and commercial vehicles in West Bromwich, England. Brothers Alan and Richard Jensen gave the new name, Jensen Motors Limited, to the commercial body and sports car body making business of W J Smith & Sons Limited in 1934. During the period between 1934, and the Company’s closure in 1976, it produced a range of sports and saloon models, but will always be best known the iconic Jensen Interceptor, four-wheel-drive Jensen FF. 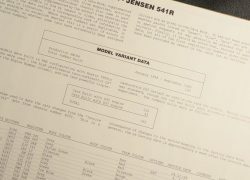 Jensen Motors ceased trading in 1976. 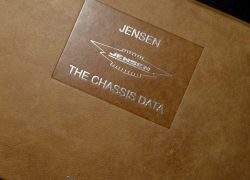 The rights to Jensen’s trademarks were bought with the company and it briefly operated in Speke, Liverpool, from 1998 to 2002. Under subsequent owners, a new version of the Jensen Interceptor was announced in 2011. It was planned to bring manufacture of that new model back to the former Jaguar motor plant in Browns Lane, Coventry. This never took place. 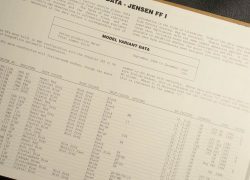 Description: Originally published in 1991 , this strictly limited edition (only 1000 printed and now long out of print) remains today as the definitive work assembling all the data relating to Jensen models from 1934 to 1976. 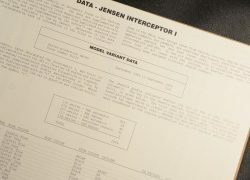 The book contains data on the ‘S’ Types, the ‘H’ types, PW, Early Interceptor, 541s, CV8s, Italian designed Interceptors, FFs, along with Jensen-Healeys, and even the very last Interceptor S4s. Included data is chassis number, engine number, registration number (if known), body colour, roof colour, trim colour, options, ex-factory, country of delivery along with any specific notes, such as celebrity ownership, etc. 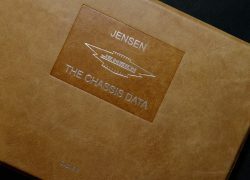 This English language edition is a must for the bookshelf of anyone interested in Jensen cars. 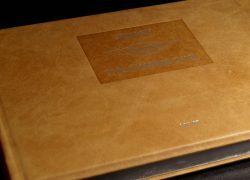 Special Binding: Covered in a beautiful grained tan leather, the cover sports a large central cartouche in burnt tan, and then with fine deeply embossed matt aluminium title blocking. The Jensen Motors winged logo is impressed to the centre of the cartouche. The spine with two ribs. The exceptionally strong 8mm cover boards with bevelled edges. 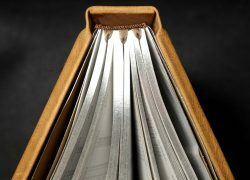 The page ends are matt aluminium gilted and the book has hand-made marbled endpapers. The book has dark brown ‘heads & tails. We have asked for triple dark brown silk ribbon markers for this title, so that three pages can be marked at any given time. Supplied within a brown linen archival slip case. Format:428 pages 33cm x 23cm.